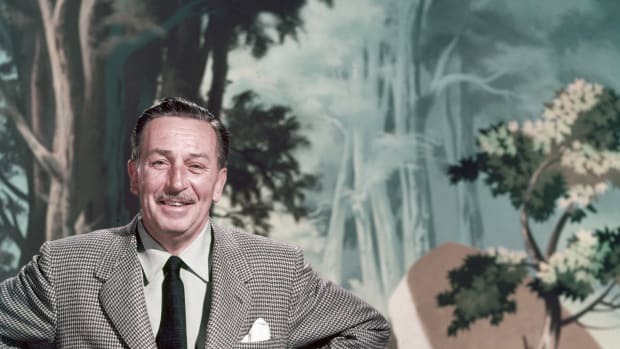 Whether or not Walt Disney wished upon a star, his dreams were about to come true as nearly half of the United States gathered around black-and-white televisions on July 17, 1955. After more than two decades of planning and a breakneck year of construction, the Mickey Mouse creator had transformed a 160-acre orange grove in Anaheim, California, into a $17 million theme park—Disneyland. 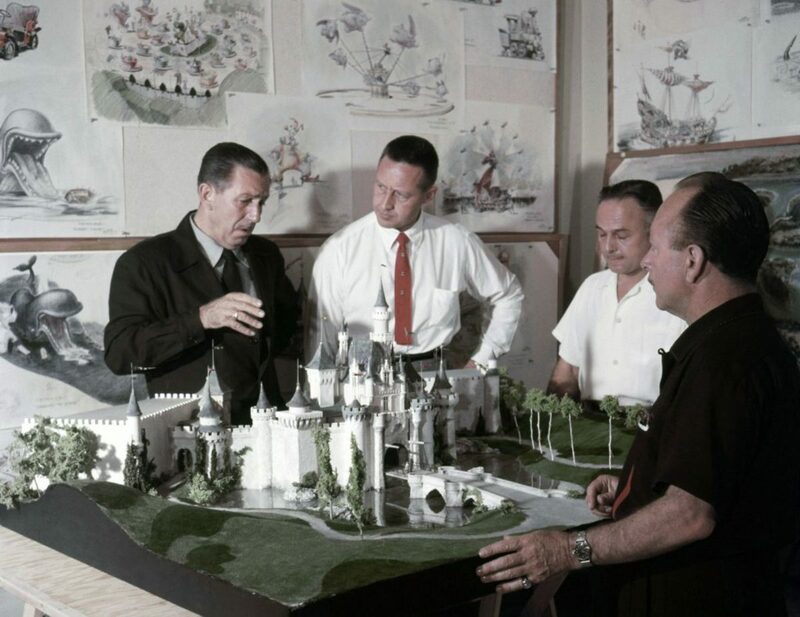 Bankers and even Disney’s brother Roy, who was the financial director of his movie studio, thought the ambitious project would lead to ruin, but the animation mogul borrowed against his life insurance and sold vacation property to build what some in Hollywood dubbed “Walt’s folly.” With his reputation and finances at stake, Disney pushed a frenzied schedule to open Disneyland only one year and one day after construction began. 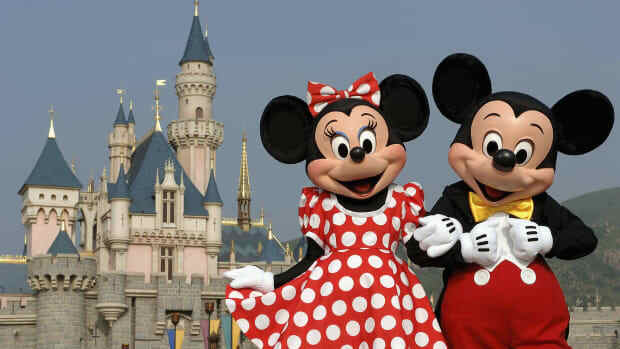 The work of hammering and painting continued right up to the start of a 90-minute live broadcast of Disneyland’s opening on the ABC television network, which aired Disney’s highly rated weekly show and was a one-third investor in the theme park. 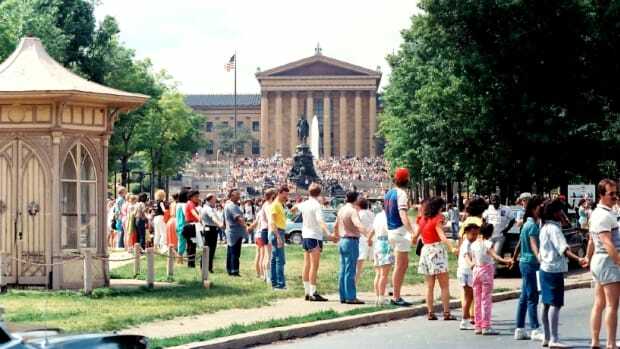 Interest in the attraction was so great that, according to Neal Gabler’s book “Walt Disney: The Triumph of the American Imagination,” an estimated 70 million people—in a country of 165 million—tuned in to watch the unveiling co-hosted by actor and future president Ronald Reagan. America watched as Disney presided over the official dedication ceremony, which included a benediction by a Protestant minister, a band playing the national anthem as military members raised the American flag and a flyover by the California Air National Guard. Then viewers took a virtual tour of the Magic Kingdom’s four realms—Frontierland, Adventureland, Fantasyland and Tomorrowland. The star-studded broadcast featured Fess Parker, who played the title role in the Disney series “Davy Crockett, King of the Wild Frontier,” parading on horseback down Main Street, USA and Sammy Davis, Jr. and a fedora-wearing Frank Sinatra speeding around a miniature motorway on the Autopia ride. Everything appeared to be unfolding like a dream, but away from the television cameras, Disneyland’s opening day was more of a nightmare. 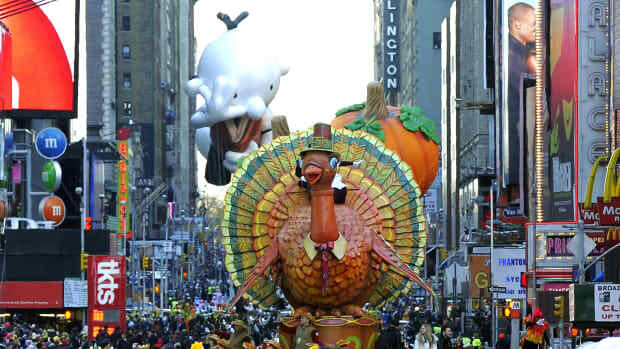 Like many Disney productions, the live broadcast was fantasy, not reality. To the disappointment of many children, some of the park’s attractions weren’t ready to operate on opening day. The Rocket to the Moon, Peter Pan and Dumbo the Flying Elephant rides were all closed. Visitors to the unfinished Tomorrowland, which was to depict life in 1986 when a trip to the moon would be an everyday occurrence, remained stuck in 1955. The rush to finish construction also caused other problems. So many weeds sprouted along the banks of the Canal Boats of the World ride that Disney ordered workers to place signs with exotic species names in Latin next to them to resemble an arboretum. In temperatures that reached 100 degrees, the fresh asphalt on Main Street, USA melted into a sticky tar that ensnared the high heels of some women while a paucity of drinking fountains due to a plumbers’ strike led to frustrations, rather than water, bubbling over. Plenty of water, however, could be found washing over the deck of the Mark Twain riverboat, which was filled beyond capacity and listing from side to side. Even worse, Disneyland was overloaded with party crashers. The theme park expected a crowd of 15,000 people at the invitation-only opening, however, 28,154 passed through Disneyland’s gates thanks to counterfeit tickets. A few more even scaled a fence using a ladder erected by a makeshift entrepreneur who charged $5 a head. Even by southern California standards, the seven-mile backup to Disneyland on the Santa Ana Freeway was epic. Passengers baked in their cars, and kids were forced to take bathroom breaks on the side of the freeway and even in the Disneyland parking lot. Unprepared for the throng, Disneyland’s refreshment stands and three restaurants ran out of food, and sweating parents and thirsty kids abandoned many of the long lines. 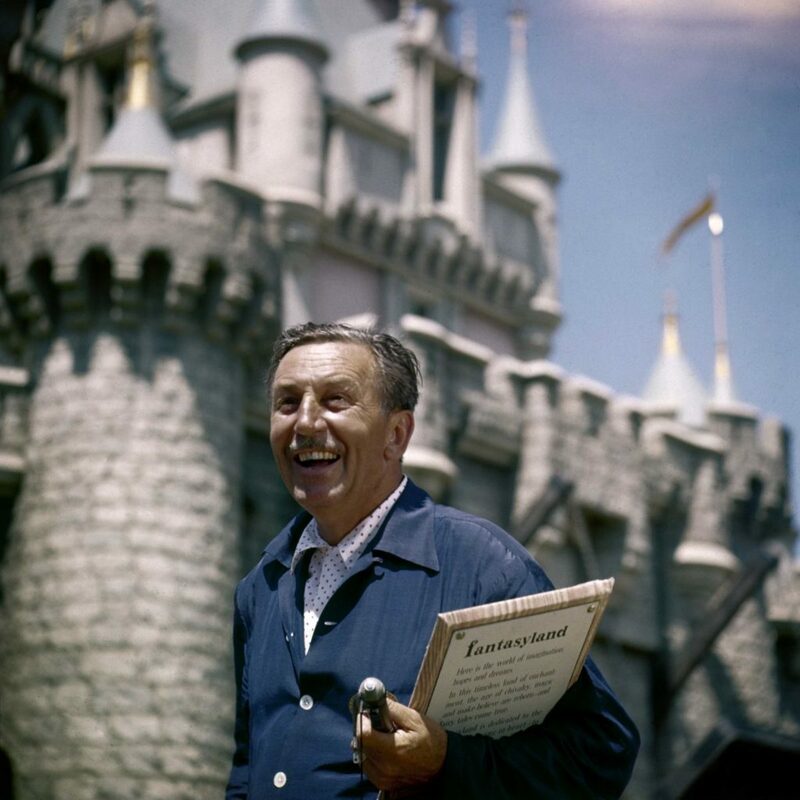 “We’ll settle down and get this place operating,” Disney assured the press before adding, “It may take a month before everything’s going smoothly.” According to “The Magic Kingdom: Walt Disney and the American Way of Life” by Steven Watts, that indeed was the case. In Disneyland’s first few weeks, the stagecoach ride in Frontierland was discontinued after it proved too top-heavy and prone to flipping over. A tiger and a panther in a circus parade broke loose and staged a “furious death struggle” on Main Street, USA. Nearly all of the 36 cars on the Autopia, which Disney envisioned as a utopian miniature freeway on which children would learn respectful rules of the road, were wrecked by aggressive drivers who crashed into other vehicles. The opening-day problems, however, did little to dissuade visitors from flocking to Disneyland. 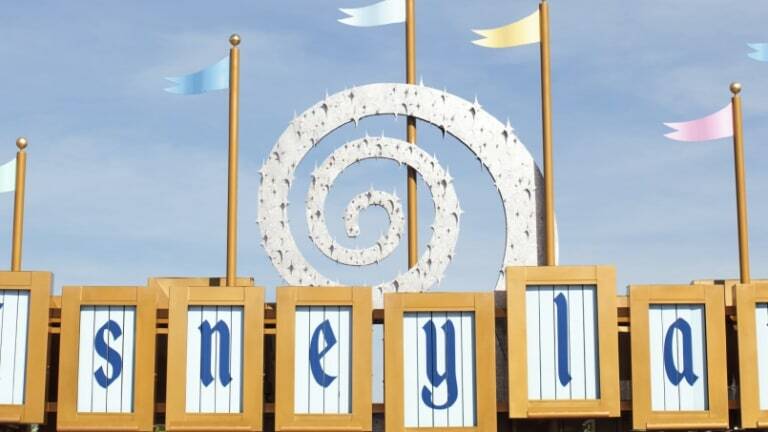 It took only seven weeks for attendance to surpass 1 million visitors, and the theme park soon surpassed the Grand Canyon and Yellowstone National Park in popularity. 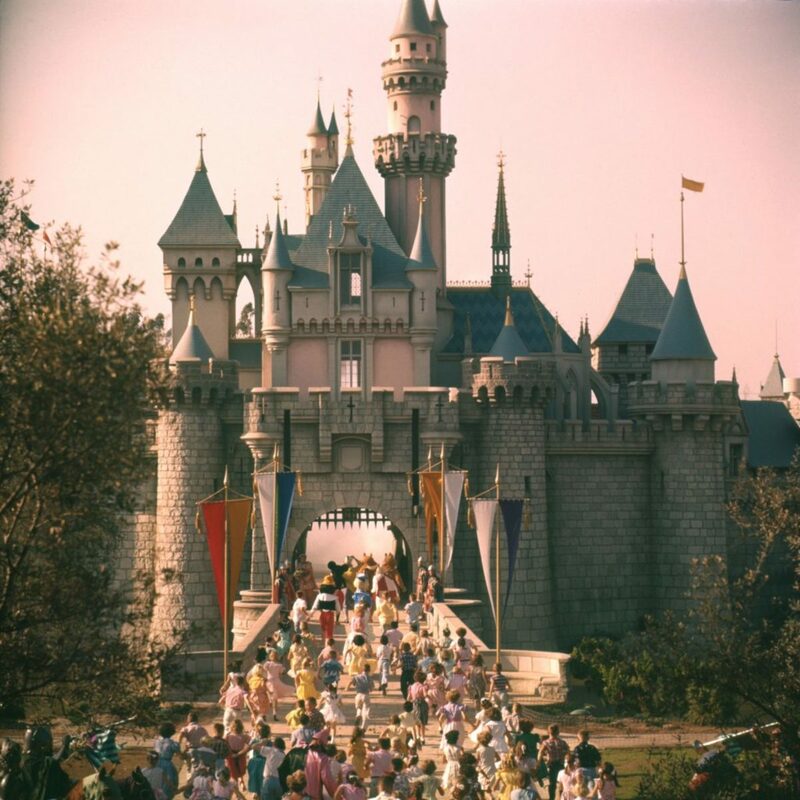 Sixty years later, more than 750 million people have passed through Disneyland’s turnstiles, and, unlike on that opening day, most of those have left the “Happiest Place on Earth” with smiles on their faces.